Discussion in 'Special Needs Crossing' started by fashionfobie, 1/17/19. October 19th 2018 a little chicken hatched from her shell. When she was very small there was little evidence of the severity of her scoliosis, but it was apparent that she may need some extra TLC. The photo above is her on her first day home. She was 1 week old. She was from a batch of somewhat reject chicks. Starlight's (chick in left of photo) posture wasn't perfectly normal, but she was still young and her severe scoliosis was in early stages. The poor little chick to her right also had a growth deformity. Her name was Xena, she passed away at 7 weeks. We miss her dearly, but when chicks have aliments it isn't easy for them. They grow very fast and things can quickly go south. Xena passed from organ failure. She never grew a tail, had a vaulted skull and suffered with a poorly formed gizzard. Poor little dear. I am very strongly against intentionally breeding for vaulted skulls.. but that is another conversation. Here they are enjoying some foraging time under my very vigilant eyes. As you can see Xena (in the middle) was still tiny. She was a large breed chicken and should have been larger than the pekin bantam on the right of the photo. They were the same age and she was half the size with poor feather growth. The posture of Starlight's neck was starting to shift, and become more apparent. This story is about Starlight. She has two nearly 90 degree kinks in her neck. She requires daily crop massages to help her. Some days she is fine, but other days she gets a little backed up and massaging helps her digest properly. She is an amazingly sweet bird. Chickens in general are very sweet and social beings. Anconas have a reputation for being very bonded to their family, but standoffish with new people. So sometimes they are described as flighty and jumpy. She is my first ancona and also a special needs bird. I have not noticed any negative personality traits. She will stand on my shoulder whilst I tend to the other chickens and she has learned to step up on request. I am just glad I was able to provide a loving home to birds that would normally be killed. Even poor sweet Xena. At least she had a chance to have friends, wing hugs, and time to be a chicken. Chickens are generally not valued as they should be. Human have exploited their amazing evolutionary tricks. They have resilient chicks that can live a few days without food. This was intended so that the hen can leave the nest with a full clutch since hatching times can vary. It breaks my heart when they aren't able to be chickens. A video of her on my lap. She is not camera shy. I will try and update this post from time to time. There may be another chicken parent out there with a scoliosis bird. It is actually a common malformation in inbred leghorns. I do not know what causes it in Anconas. Being of a similar body type to Leghorns... I sometimes wonder if Starlight's parents were brother and sister. Starlight has been in the chicken enclosure and joined the flock. She is adjusting ok, but it is never easy to find your place in the pecking order. She is molting now. Fun ancona fact, with each molt they get more and more white speckles. When they are elderly their colour can change to almost all white. CrazyBirdChick, Peachfaced, hrafn and 5 others like this. Here she is on my shoulder. You can see in this photo how her head it situated toward the left side of her body. She struggles to hold up her right wing. Her resting posture is with it sagging a bit. She manages to fly with her condition and can get to my shoulder and higher perches. T-Rex is the head chicken in the flock, the larger black australorp in this photo. She is very sweet and kind to little Starlight. Silvermoon is lower ranking, so she is much more concerned about how Starlight upsets her status. Next weekend we are going to pick up another pullet or two of a similar age/size as Starlight so she can have a few peers, since Xena passed away and Buttercup ended up being a roo this is the only way. Buttercup will enter a breeding program, he is a very cute little Pekin. Currently he is Starlight's closest friend so it is really sad for her. Every night they are sleeping in the same nest box. My city council forbids roosters, but allows urban chicken keeping. There is simply no way around it. CrazyBirdChick, Peachfaced, BirdField and 1 other person like this. For the story this is Silvermoon, the white leghorn. T-Rex is very judgmental of her, especially with the passing of Rodger. Rodger was our original head chicken, she was a girl. The problem when you let a friend name your bird. Rodger in the centre of this photo. Nothing like a yummy oat and yogurt snack. Rodger passed from old age and had a heart attack. CrazyBirdChick, Peachfaced and BirdField like this. Update on Starlight. She is approaching 5 months old. She just finished a molt and has gorgeous new feathers. She has bonded to our head chicken T-Rex. T-rex is such a sweet soul. I am so lucky to have such an even tempered and reasonable hen. There was a very intense rain so please excuse the dishevelled enclosure. Their waters are nests are cleaned daily. They live in an 18 sqm enclosure with natural branches, a chicken swing, potted plants (which they eat fairly quickly) and a raked dirt bath. Additionally they have their house set up within the enclosure, which has 3 nest boxes. They also get time to forage the yard most days. Our yard is sadly not fenced at this house, so they can only roam when I can sit and watch them. They are enjoying some organic pumpkin yum! Starlight works very hard to hold her wing up. When she is in a relaxed state it will still sag, but she is definitely holding it up much better than when she was younger. Her neck has the two 90 degree turns. This makes her take on some fairly unique postures. She also cannot graze like a normal chicken. She needs to bend her knees to reach the ground. Her knees actually have callouses from where they rest on the ground when she pecks. She no longer requires crop massaging, I think she has finally learned her own eating limits and she is crazy for green veg. The forth photo introduces Luna, our pekin bantam. Luna is a very kind and sweet bird. Sweetest little peck when she eats oats from your hand. She is already laying and she has also bonded strongly with T-Rex and Starlight. At night all three seem to share one nest box. All smashed together in a fluffy pile. It is adorable. It is not typical for chickens to sleep this way. They normally like to roost of their roosting perches. I will update again later at a future date. So far Starlight hasn't laid eggs. She is right around the age where she could start. We are not certain yet if she can, we also are concerned of egg binding because of her scoliosis. Finger's crossed she doesn't hurt herself. SandraK, CrazyBirdChick, Peachfaced and 1 other person like this. Starlight laid a normal and healthy egg. This is really great news! Now I just hope her condition doesn't worsen with age. She has grown into a very sweet and excitable hen. I may have over protected her as a chick, because she is useless when it comes to alarm calling. Luckily my hen Nova is amazingly vigilant so she has someone she can depend on. Now if only someone would stop kicking the straw out of the nest box. SandraK, BeanieofJustice, MommyBird and 1 other person like this. BeanieofJustice and fashionfobie like this. This is such a fun thread to read. Your photos give more insight to the whole story of Starlight... and they are all wonderful! And I must say..... that is one shiny egg!! Good job Starlight! The egg was washed! It was not dry yet in the photo. It dries to a normal eggshell look. The egg has a nice thick shell and feels very healthy. Mockinbirdiva and BeanieofJustice like this. 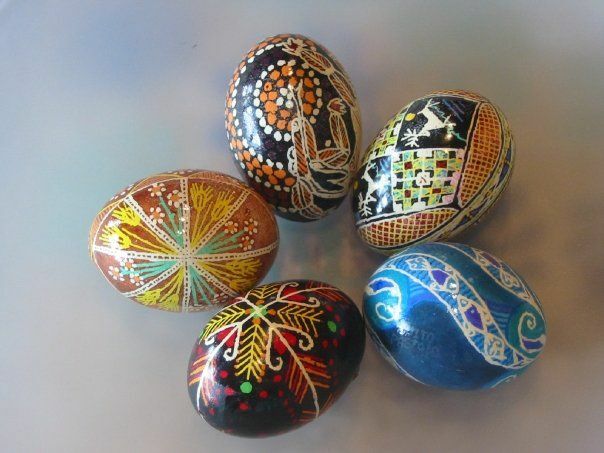 With all your chickens you should take up the art of Psansky ....Ukrainian painted eggs. You probably have a nice supply of fresh eggs to work on! I have also done painted eggs but I painted on Emu eggs... bigger surface! Loved reading this! Thank you helping her..
@Mockinbirdiva That is a beautiful Emu egg! Well done. We normally eat their eggs and crush the shells into the compost for the garden. I will consider painting a few. I never buy store eggs. Even with the more generous laws on commercial egg laying enclosures in Australia, the hens are not treated well. At my home we keep our hens till they pass from old age and we actually don't have many eggs at the moment. T-Rex hasn't laid in about 9 months. Silvermoon stopped laying around 4 months ago. Starlight and Luna are laying right now, but they have cute tiny eggs. Mockinbirdiva and SandraK like this.